For the first time, scientists have modeled the entire life cycle of solar flares, those violent eruptions of intense heat and radiation from the surface of the sun. The new computer model is part of an ongoing effort to gain a better understanding of solar flares and related solar events, which blast out high-energy radiation and fast-moving particles that can pose a serious threat to our high-tech society. "Solar flares and eruptions can disrupt radio communications, global positioning systems and affect aviation and the safety of astronauts and our communications satellites," Mark Cheung, a staff physicist at the Lockheed Martin Solar and Astrophysics Laboratory in Palo Alto, California, and co-author of a recent paper describing the model, told NBC News MACH in an email. "This research is teaching us how the sun evolves, and how it affects our daily lives." But if it sheds new light on the formation and propagation of solar flares, the new research also reveals the dazzling beauty of a celestial phenomenon we never get a chance to see first-hand. A dazzling visualization of the model shows tangled tendrils representing magnetic field lines around sunspots rising from the sun's surface and exploding in a brilliant, multicolored flash. To create the model, Cheung and his collaborators at the lab and the National Center for Atmospheric Research (NCAR) in Boulder, Colorado, employed computer software that uses a series of equations that describe the behavior of plasma, a superheated material that's ejected from the sun as flares fire off. The model simulates solar activity as far as 10,000 kilometers (6,000 miles) below the sun's surface all the way up to 40,000 kilometers (25,000 miles) into the solar atmosphere, or corona. Then the scientists punched in the conditions on the sun that roughly approximate those associated with a sunspot observed in March 2014 that generated dozens of flares — and watched as the model successfully generated a flare of its own. 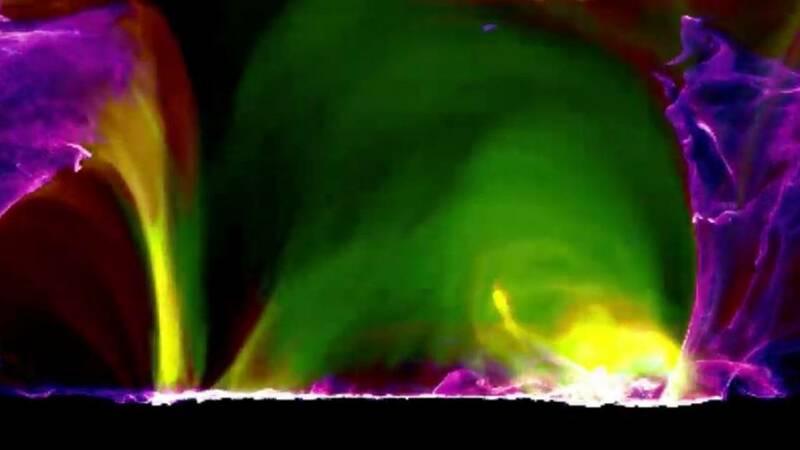 "Our model was able to capture the entire process, from the buildup of energy to emergence at the surface to rising into the corona, energizing the corona, and then getting to the point when the energy is released in a solar flare," Matthias Rempel, a senior scientist at NCAR and a co-author of the paper, said in a statement. That's different from previous models, Rempel said in an email, which "modeled details very well but had to compromise when it comes to setting up the whole picture." Rempel's take on the new model's significance was echoed by David Jess, a scientist at the Astrophysics Research Center at Queens University Belfast in Ireland, who wasn't involved in the new research. In an email to MACH, he called it a "remarkable achievement in this field of research," adding that "models that can better predict not only how large a solar flare will be but also when it will 'go off' can help researchers and engineers make better decisions when it comes to safeguarding our Earth's infrastructure." Safeguarding our infrastructure is certainly a high-stakes challenge, given our society's heavy reliance on computers and other electrical appliances and systems. Experts say efforts to calculate the overall economic cost of a serious solar event are in their infancy, but one 2012 paper said the cost could reach $2 trillion. Power utilities and government officials are developing various ways to protect the electrical grid from solar events, including adding special circuitry capable of absorbing excess energy and deploying emergency transformers.